Hon Jo Goodhew has today (16 March 2017 NZT, 15 March 2017 EDT) delivered New Zealand's National Statement at the Sixtieth-First Session of the United Nations Commission on the Status of Women. E aku rangatira, tēnā koutou katoa, ka nui te honore, ki te mihi, ki a koutou. I am honoured to be here with you and our colleagues from around the world to present New Zealand’s National Statement to the 61st session of the Commission on the Status of Women. New Zealand welcomes and endorses the statement made by Honourable Charmaine Scotty on behalf of the Pacific Island Forum Secretariat. 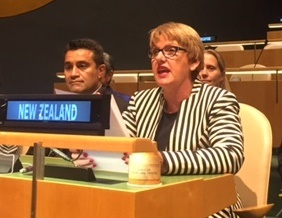 I am pleased to reaffirm New Zealand’s strong commitment to the Beijing Declaration and Platform for Action, the Convention on the Elimination of All Forms of Discrimination Against Women, the Paris Agreement on climate change, UN Security Council resolution 1325 and subsequent resolutions relating to women, peace and security, and our support for the Sustainable Development Agenda 2030. I welcome this year’s priority theme on the Empowerment of Women in the Changing World of Work. The digital revolution and expectations from a new generation of workers are shaping the way we deliver and collaborate, transforming the workplace and, with it, people’s lives. But there is a global revolution of another kind. The growing appetite for strengthened gender equality and the widely recognised business benefits of diversity have put a spotlight on achieving inclusive economic empowerment for all women. New Zealand is proud of its legacy of empowering women to lead independent and self-determining lives. Last year, we submitted our 8th CEDAW report to the United Nations, highlighting progress for women in New Zealand. Our CEDAW report shows that New Zealand women are doing well in education and work. 1. We are encouraging wider uptake of flexible work so that women aren’t penalised for their choice to balance work with other responsibilities. 2. We are encouraging and supporting women to work and train in areas that offer good pay and good prospects, such as digital technology, engineering, and trades and construction. 3. We are promoting diversity in leadership through programmes that educate on the valuable skills women bring to the table. The New Zealand Government recently established a working group to develop and recommend pay equity principles for female-dominated workforces where the work may have been systemically undervalued. The Government has committed to update the Equal Pay Act and amend the Employment Relations Act to implement its decisions on the recommendations. The Government is working with employers to raise awareness of gender pay gap issues and what they can do to reduce it. This month, we released research on the reasons for our gender pay gap. The research shows that 80 percent of the gap is perception about behaviour, attitudes, and assumptions about women in work, including conscious and unconscious bias. I wish to remark on the significance of this year’s focus area: The Empowerment of Indigenous Women. New Zealand is committed to the aspirations of the United Nations Declaration on the Rights of Indigenous People. With Māori, Government has developed unique approaches to support Māori development. The principle of “partnership” is central to this approach. Examples include: initiatives to get more Māori women into trades training; and the Māori Women Development Incorporated, which provides loans to Māori women to assist them to commence business, and runs a coaching and leadership programme for indigenous women. Madam Chair, New Zealand recognises that we still have much to do to achieve gender equality and to empower our women and girls in all aspects of their lives. We look forward to engaging with others on how we can deliver positive outcomes for women and girls at a global level.